Portfolio direction remains intrinsically tied to the overall corporate initiatives of an organization, requiring portfolio strategists to maintain clear knowledge of the reasons behind corporate goals and to report back to xecutives on progress toward objectives. A practical approach is needed at the portfolio strategy level in order to work with organizational leadership to ensure alignment and strategic fit of new products. Tactics will be shared for discerning portfolio strategy within the context of executive leadership’s development goals such as filling pipeline gaps, entering a new geographical area and shareholder considerations. 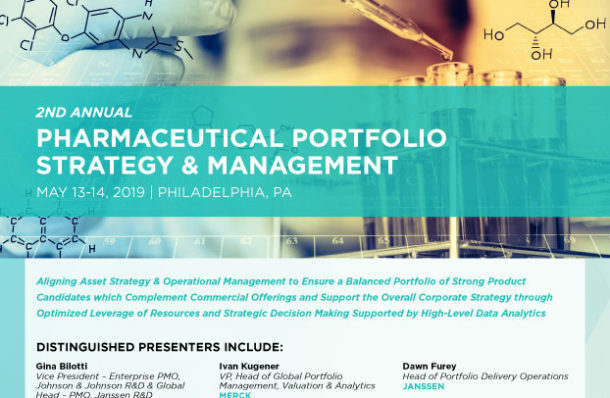 In a setting with finite resources, pharmaceutical portfolio strategy and management executives are continually striving to leverage assets both financial and operational including materials and staff to ensure an alignment between R&D priorities and current commercial products. Striking the most appropriate balance, which mitigates risks while at the same time ensuring new products enter the market in an expeditious manner is incredibly challenging and requires detailed insight into multiple projects at varying stages across the lifecycle. Multiple case studies, highlighting the strategic aspects of R&D budgeting against the operational management of assets will ensure participants gain insights into the importance of internal alignment to optimize resources. Within the pharmaceutical industry, portfolio strategy and management professionals alike continuously strive for more effective methods of measuring commercial potential, seeking to balance calculations of revenue, cost, timing, and risk to ultimately arrive at net present value. Additionally, multiple interpretations of each factor are employed, resulting in calculation variations across organizations and individuals. Industry members will benefit from this hands-on opportunity to share techniques for reaching the most accurate calculation of commercial potential. In small group discussions, participants will have the opportunity to dive deeper into one of a variety of tools or strategies surrounding the use of data in portfolio decision making, operational management and strategy, providing a platform for peer-to-peer exchange on experiences, challenges and best practices. With a focus on practical solutions, the small groups will highlight the opportunities which exist in leveraging high levels of data to ultimately support the corporate goals. Although vast volumes of data surrounding product candidates is generated by pharmaceutical corporations, rolling up the data into a format which becomes usable requires strict data integrity, secured through governance frameworks utilized by all data collection points throughout the organization in a harmonized and effective manner. Varied technologies supporting data collection and the evolution of data analytics frameworks have resulted in challenges surrounding data integrity which ultimately hinder decision making. In order to support the optimal decision regarding overall portfolios as well as individual product candidates, pharmaceutical organizations must ensure data is of the highest accuracy through strategies such as the use of single-source data. Data accuracy is a crucial area of focus for both portfolio managers and portfolio strategists in the industry, with professionals in each discipline dependent upon the other for upholding agreed-upon standards. However, the ways in which questions of data integrity and governance must be approached differ according to the perspective of the individual’s role in the process. This breakout session will allow delegates to share solutions to mutual challenges among peers addressing data veracity from similar viewpoints.